Photo: Philip J. Black House, ca. 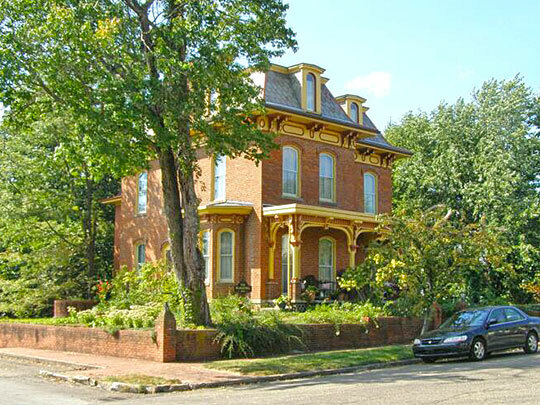 1856, 303 North Water Street, Loudonville, OH. Listed on the National Register of Historic Places in 1980. Photographed by User:Chris Light (own work), 2010, [cc-by-3.0 (creativecommons.org/licenses/by/3.0)], via Wikimedia Commons, accessed June, 2015. Ashland County government offices are located at 142 West Second Street, Ashland, OH 44805; phone: 419-282-4242. Ashland County has a rich history that can be traced back to thousands of years when indigenous cultures once inhabited the area. Artifacts and remains of ancient mound-building Indians were found in Gamble's Fort in the northern section of the County. As recently as 200 years ago, several American Indian tribes inhabited the area, including those known as the Wyandot, Erie, Mohican, Mingo, and Delaware. The Ashland County area has also been the home of many well-known people. One of these is John Chapman who is better known as Johnny Appleseed. He was born in 1775 in Springfield, Massachusetts, but traveled the area planting apple orchards along the streams within the borders of present day Ashland County. In addition to planting apple seeds, Chapman was known for helping his neighbors by alerting settlers of the dangers from the Indians.